This is a myth. The United States never led the world. It was never number one and has never been close to number one on international math tests. Or on science tests, for that matter…. [And] there has been no sharp decline—in either the short or long run. 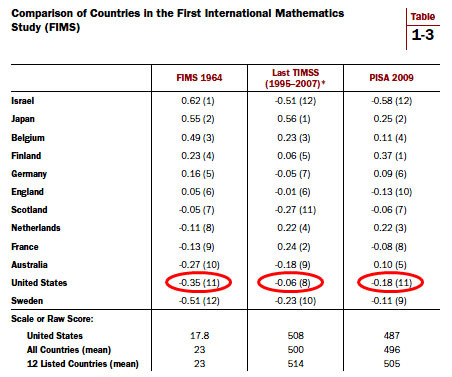 The United States performance on PISA has been flat to slightly up since the test’s inception, and it has improved on Trends in Mathematics and Science Study (TIMSS) since 1995. Maybe so. One thing that’s pretty clear, though, is that America does a terrible job of educating low-income students. But even there, the comparative data is unclear (or at least, I’ve never seen clear data). Do our low-income kids score worse than other countries’ low-income kids? Or do we simply have more low-income kids? Since income figures aren’t routinely gathered for these tests, and international comparisons of income are problematic anyway, this isn’t an easy question to answer. I’m supportive of experimenting with education reforms. We’ll never know for sure if there are better ways of educating our children unless we try lots of things and see what works. Still, the one metric that’s always crystal clear, no matter who’s doing the measuring, is that school performance plummets when the concentration of low-income kids gets above 50% or so. This suggests — though it doesn’t prove — that the real problem is poverty, not terrible schools. Unfortunately, that’s an even harder problem to solve than schools by themselves. 1Yes, yes, it’s a table, not a chart. So sue me.